Blizzard’s Battle.net service is giving players what they want—access to their gaming friends on every device, whenever. It’s a push for hyper convenience, but will undoubtedly lead many players to wonder which chat service they should use. On Battle.net’s beta version of its desktop app, a “Social” tab is now visible. Players can voice or text chat through groups, private DMs and channels. The update will also let them customize profiles with personal avatars and an “About” line. It’s super convenient for players who want to use the same client to chat inside games like Overwatch and also when they’re browsing the web. 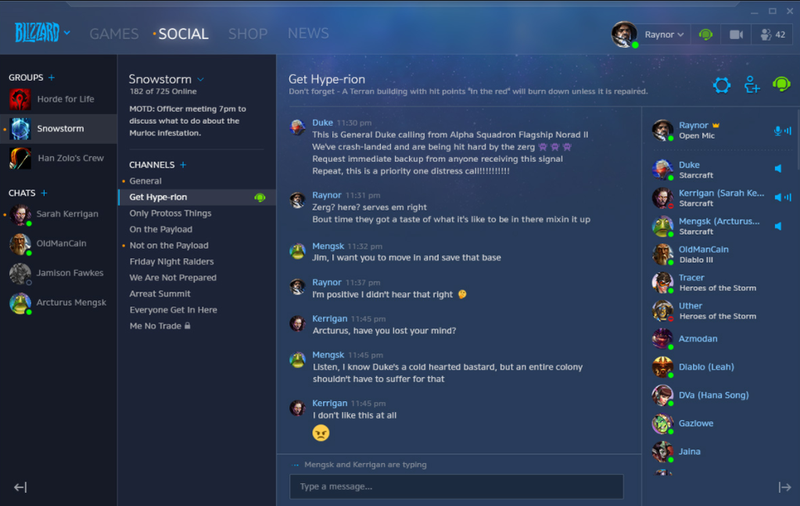 And with Battle.net’s new mobile app, gamers can chat with each other basically anywhere. That will make coordinating World of Warcraft raids or organizing an Overwatch six-stack a lot easier than repeatedly logging onto our desktops and shooting frantic chat messages into offline friends’ inboxes. The problem? A lot of us were already doing those things with Discord—at least, most of them. Discord, which boasts over 45 million registered users, offers the same voice or text chat through channels and private DMs, but doesn’t have the same in-game integration. Discord does have a lot of things Battle.net doesn’t, though—I love knowing what Steam games my friends are playing, and if they link their Steam account to their Discord account, that info shows up right on the app. Also, today, Discord added in video chat with up to 10 people and screen-sharing, which will definitely help expand the gaming app’s relevance beyond gamers. Hell, who knows—maybe Discord will replace the office chat app Slack one day. With Battle.net’s new all-platform integration, StarCraft and Overwatch players will have to decide whether to stick with Discord or move to Battle.net for all their chatting, which could inadvertently splinter some friend groups. The Battle.net update also includes an “appear offline” feature, so we can finally play Diablo III without being pestered by friends to go capture the payload.